With some of the friendliest people of all (my arm actually got sore from waving so much! ), Rwanda has nevertheless had a chequered and tragic recent history that can’t be ignored. Discovering its story and choosing to educate yourself about the horrific crimes committed here are just one things to do in this now peaceful and blossoming nation. I visited the country as part of my super African overland trip and loved my time here. 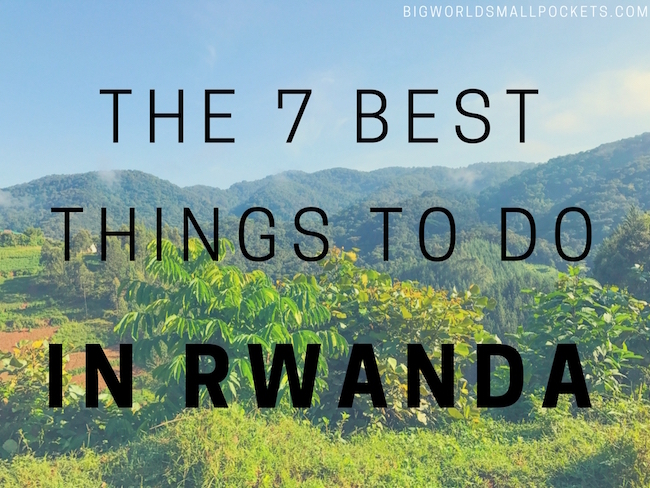 So, in homage to this rich, tropical green country filled with seemingly endless rolling hills, here are the 7 best things to do in Rwanda. Rwanda’s recent history can be hard to stomach, but the Genocide Memorial Centre in the capital Kigali does a fantastic job of educating us about it and providing an important space of remembrance and peace. Taking the audio guide through the exhibition and displays is highly recommended and well worth paying the extra for, giving you an in-depth understanding of the horrors that took place here in 1994 as it does. The centre also acts as a burial ground and a vital space for the nation’s bereaved. Opened in 1999, it’s been incredibly well put together with some beautiful garden spaces surrounding it. I would never think of travelling to Rwanda without proper coverage and always recommend travel insurance from World Nomads who I’ve used during my time in this country and throughout Africa. I love their great coverage of safari activities – crucial for a country like Rwanda – as well as their excellent customer service and ability to claim online, which is very handy if you’re travelling in remote places for a long time. 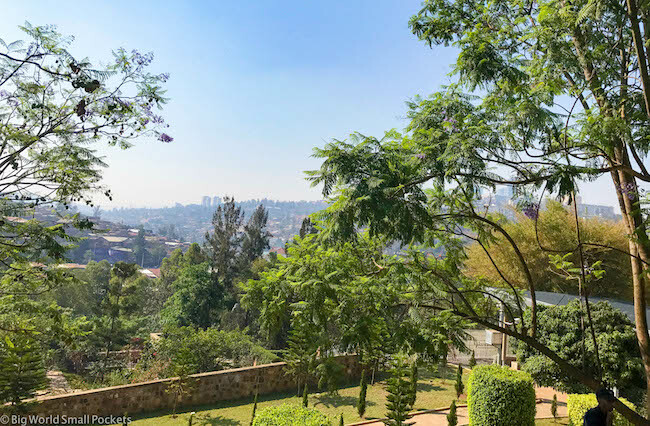 It seems strange to be linking one of the worst genocides in human history with some the best things to do in Rwanda, but if you’ve seen the movie, Hotel Rwanda, you’ll know what I mean. This incredible film depicts the amazingly brave and true story of the hotel manger here, who managed to keep 1268 people safe inside the building during the killing sprees in 1994. 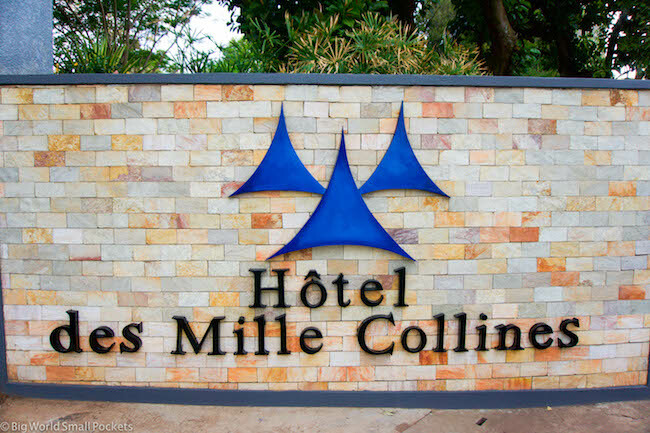 If truth be told, the actual Hotel Rwanda – really called the Hôtel des Mille Collines – was not used in the film, but the real building still exists today in Kigali. A prestigious place, it’s still worth going here in homage to the selfless acts conducted here and to enjoy the view from the terrace. You can, of course, also stay the night. #1 East Africa Lonely Planet – I’m always a big fan of the Lonely Planet and their East Africa edition is great for its Rwandan accommodation recommendations. #2 Headlamp – Given the power outages you’re bound to experience in rural Rwanda, having a head lamp in your bag is an absolute must. I wouldn’t be without my Black Diamond one. #3 Sarong – There’s few items as versatile as the trusty sarong when it comes to African travel. I love the beautiful designs and great prices of One World Sarongs. #4 Insect Repellent – Much as I hate nasty chemicals, a good DEET repellent is essential for Rwanda where malaria is a real risk. I recommend a 30% DEET product to keep those pesky nippers at bay. #5 Sun Hat – Located as close to the equator as it is, the sun is Rwanda is super strong and a sunhat to protect your face is highly recommend. I’m a big floppy hat fan and love this Hello Sunshine design. In Rwanda’s rich rainforest landscape live some of the most endangered, but incredible animals on this planet. They just also happen to be one of our closest relatives! 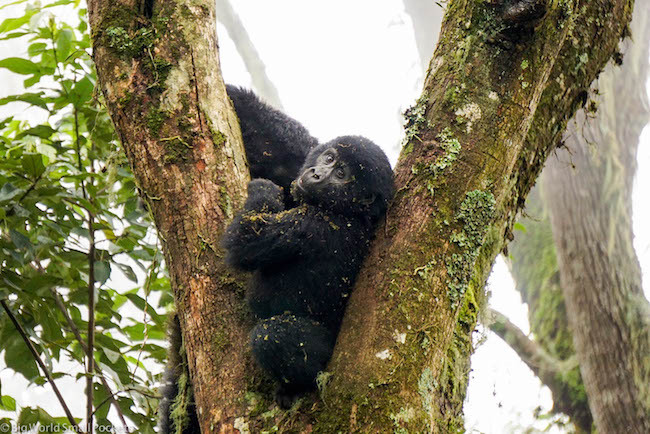 Yes trekking to see the gorillas – while really expensive – is one of those lifetime opportunities you can’t afford not to do when in this part of the world and it’s definitely one of the most famous things to do in Rwanda. Here, the mountain gorilla populations are largely based in the Volcanoes National Park, which also provides some stunning scenery and great hiking as you make a visit to these large primates. Home of the famous conservationist, Dian Fossey, who worked tirelessly to safeguard the gorillas from extinction, there are still only around 700 of these animals in the park, which is also home to Dian’s grave. Guides are of course a pre-requisite in the park and Rwanda is now charging top dollar for the privilege. As such, you may want to opt for some Uganda gorilla safaris instead, where the price is almost half of that. See the post about my experience here. Speaking of primates, you can also view chimpanzees in the wild in Rwanda and one of the best places to do so is Nyungwe Forest. 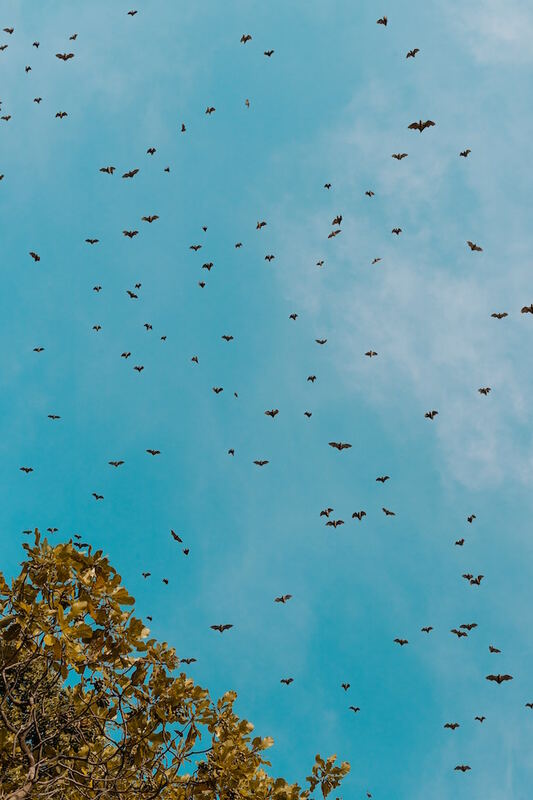 With canopy walks and waterfall hikes, the scenery here is breathtaking and the many bird and butterfly species, as well as golden monkey populations, definitely make it one of the top things to do in Rwanda. Once again guides are advised, but you can drive to the forest and pick up a guide directly there, rather than having to take a tour all the way from the capital. There are actually 13 hikes in this park – that’s over 130km of trails – most of which traverse ancient and stunning rainforest. That said you must have a reasonable level of fitness to tackle most of them. 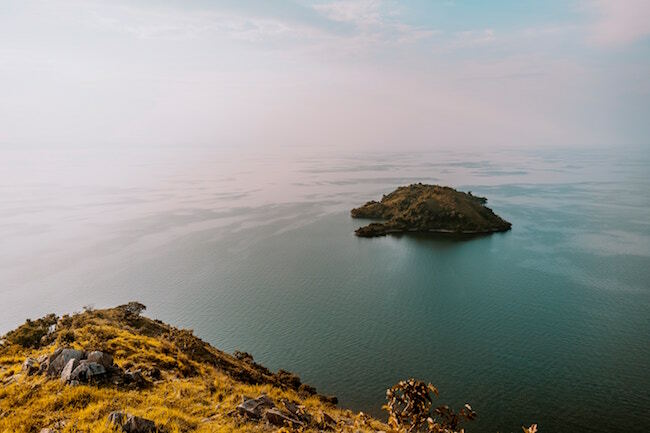 One of Africa’s great lakes, the freshwater Lake Kivu is famous for its boat rides, which allow you to enjoy the many small islands located within it. A peaceful spot, Lake Kivu is a winner of a thing to do in Rwanda if you’re looking for some downtime. LOOKING FOR A BUDGET TOUR IN RWANDA? 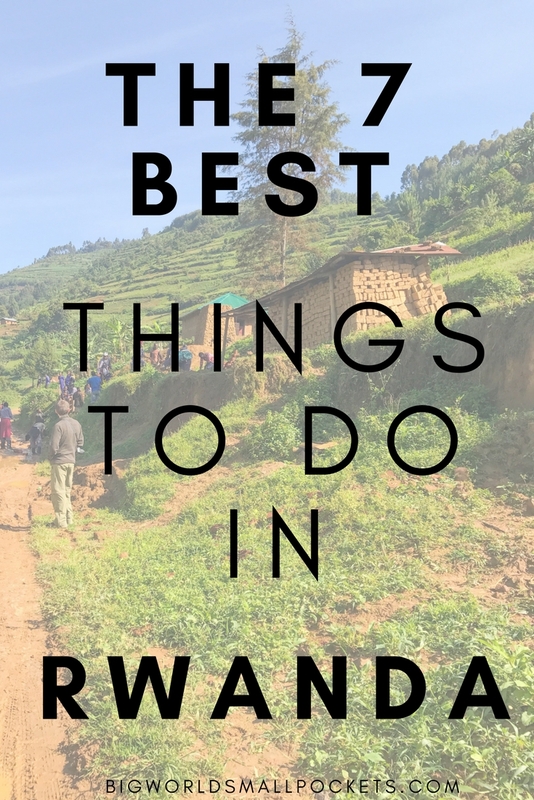 If you’re interested in an unforgettable, well-priced tour in Rwanda with guides you can trust, then email me at steph@bigworldsmallpockets.com and I’ll send you my top recommendations – simple! Rwanda’s top national park, Akagera is a safari paradise and is the last protected wetland in Central Africa. It’s the only place in Rwanda where you can see the Big 5 and these are accompanied by giraffes, zebra as well as antelope, baboons and hundreds of species of birds. So don’t feel like you have to go to Kenya, Tanzania or Uganda for your safari experience, heading to Akagera is definitely one of the best things to do in Rwanda. The Musanze Caves are a bit of an anomaly and I must admit I didn’t visit them during my time in Rwanda. 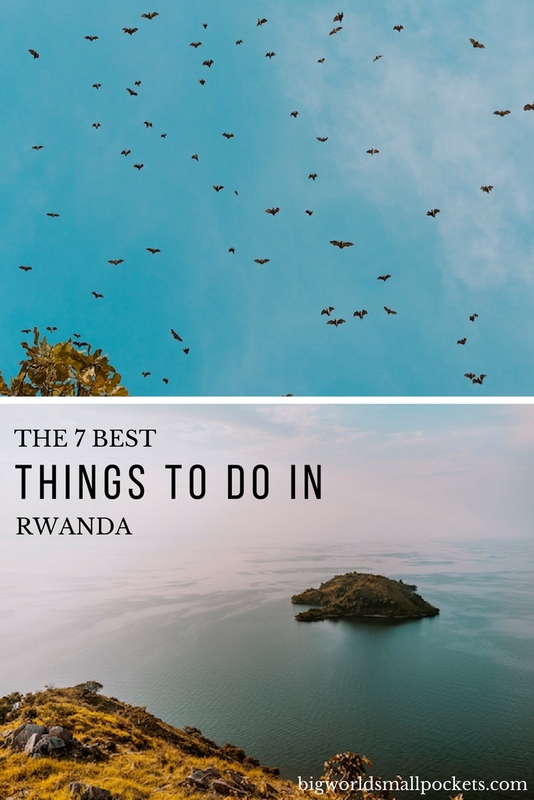 However, when I was researching this article, I came across them and they looked ridiculously cool, so I couldn’t resist adding them into this list of the best things to do in Rwanda. 2km from the town of Musanze / Ruhengeri, which is near where you trek with the gorillas, these 4 caves were created from lava flows when the Rift Valley was being formed around 65 million years ago. Bats rule the roost here, and shards of light along with twisted vines break atmospherically through to this underground world in the places where the caves’ ceiling has fallen in. its a really good destination for visit of course.